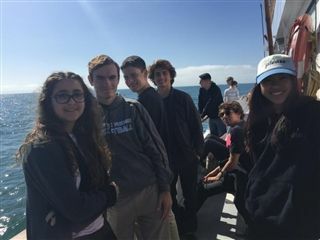 On Tuesday, March 15th, the Marine Biology class embarked on a whale watching tour to coincide with a unit on Marine Mammals. Students made firsthand observations of different marine mammal species in their natural habitat, including gray whales, blue whales and dolphins. The group was able to experience how marine mammal research is conducted and the current threats that face local populations. The trip also highlighted some of the complex ecological relationships that exist between marine mammals and other marine organisms such as fish, invertebrates and microorganisms.